Which came first—the chicken or the egg? Scientists spent years studying this question before concluding that, most likely, the egg came first. A similar question applies to the study of alcoholics: which came first—the alcoholism or the depressive disorder? While alcohol and depression are linked, researchers have worked hard to determine exactly how this link comes to be. In essence, what researchers have studied is whether mood disorder leads to alcoholism or does alcohol cause depression. As it ends up, there is no clear-cut answer because the two disorders are deeply intertwined. Does Depression Drive People to Drink? Not every person with depressive disorder drinks at all, much less is an alcoholic. However, individuals suffering from depression who are not in active treatment are more likely than the general population to be alcoholics. This tells us two things. One, depression and alcohol abuse are connected. Two, by treating the depressive disorder, it is easier for the individual to avoid falling into the trap of alcoholism. To understand how alcoholism and depression play off of each other, one must understand what the mood disorder is. Perhaps the best way to understand this disorder is to look at its symptoms. 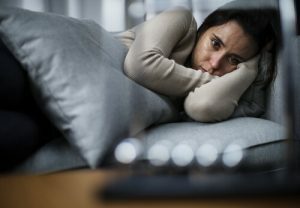 Reading through these symptoms, it is clear this mood disorder is not easy to live with, which is why so many people seek treatment. However, many people with the depressive disorder are unwilling or unable to access medical treatment for their depression, so they instead feel pressured to self-medicate. This does not inherently mean turning to alcohol. There are numerous ways people self-medicate, including taking drugs, gorging on food, and even shopping sprees. 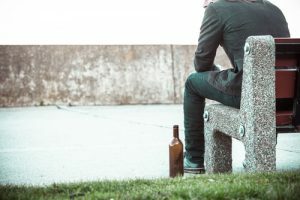 But for many, alcohol holds more appeal than other ways of trying to escape their disorder, which is even more worrisome when speaking about underage drinking. Why is this? It can be contributed to many reasons. Alcohol is more accessible than drugs and carries less of a stigma. Compared to more benign forms of self-medication, drinking—from the user’s perspective in the moment—better masks the symptoms of their mood disorder. They might choose it to relax so they can stop feeling anxious, fall asleep, or quiet their feelings. Because alcohol does make us feel more relaxed after a drink or two, the logic used to justify self-medicating with it seems solid to those trying to escape depression. Pregnancy and alcohol also have a worrisome connection as women with postpartum depression tend to abuse alcohol as well. So, does depressive disorder drive people to drink? Yes. But this does not mean alcoholism cannot lead to depression, especially alcohol and depression the next day. The problem with thinking alcohol can help individuals deal with depression is alcohol is a depressant. This means it slows down or inhibits the functions of the central nervous system. With a drink or two on occasion, this can manifest in a way that makes the user feel good and relaxed. But when binge drinking or drinking regularly, this will have a negative impact on the brain, and thus mood disorders and more severe conditions as alcoholic dementia. Heavy use of alcohol, even on a single occasion, can disturb the balance of neurotransmitters in the brain. Long-term alcohol abuse can alter this balance permanently and even reduce the size of brain cells. In addition to altering the mood of the user, this can cause memory loss, confusion, seizures, and more. Alcohol and bipolar disorder together both can contribute to an unstable mood. But can alcohol cause depression? Bo th heavy and long-term alcohol use alter the brain, and the effect on neurotransmitters means depression is a result of alcohol use. Excessive drinking is generally defined as drinking 15+ a week or often having 5+ drinks at a time for men and having 8+ drinks a week or often having 4+ drinks at a time for women. As a result, anyone who is by definition an alcoholic is consuming alcohol to the degree that will impact the brain as one of the side effects of alcohol. Among the ways, alcoholism can impact the brain are causing depressed moods, anxiety, and sleep disorders. As it ends up, these are also all symptoms of depressive mood disorders. Given this, it is clear that alcohol-induced depression is real, meaning we can conclude that alcoholism causes depression. What is less clear is if alcoholism causes long-term, chronic depression. Depression after drinking alcohol next day is one thing, but it is not known if an alcoholic will develop a true depressive disorder strictly due to their alcohol consumption. In some cases, the changes in mood will last longer than just a few days, such as with alcohol withdrawal depression, but causation of depressive disorders is not yet proven. In other words, it is unknown if someone without prior mood disorder or a predisposition to depressive disorders will develop the disorder as a result of alcoholism or just suffer post alcohol depression. In some cases, severe symptoms of delirium tremens can develop. Both alcohol and mood disorders are found to run in families. Research has shown genetics significantly influence the likelihood of developing alcoholism. Genes are thought to contribute to about half of a person’s risk of developing alcoholism. The other half of that risk can be contributed to the environment, social factors, and the presence of other disorders which can push an individual towards using alcohol—such as pain disorders and mood disorders. About half of all people suffering from alcoholism will struggle with the depressive disorder as a psychological effect of alcohol abuse, and the reverse is true as well. It is advised that those with family histories of depression and alcoholism take great care in limiting their alcohol intake and being cognizant of their risks. Because these two disorders feed off of each other, they must be treated together. If depression is treated but not alcoholism, then alcohol depression will persist, negating the effects of treatment. If alcoholism is treated but not depression, the pull to self-medicate will likely be too strong to overcome. Individuals looking to recover from both disorders must seek treatment from a rehabilitation facility which specializes in treating both the addiction and the mood disorder. 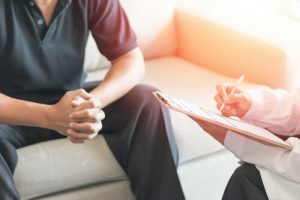 The good news is that since depressive disorder plays a role in many types of addiction, most rehabilitation facilities will be able to offer treatment addressing both issues. Patients can choose between residential, outpatient, and combination treatment. In most cases, it is recommended that the patient start with residential treatment then transition to outpatient as detoxing from alcohol can be deadly. Both depression and alcoholism can devastate the individual suffering from the disorders as well as their loved ones. However, there are excellent treatment options in the alcohol rehabs available that help patients to develop the skills needed to manage depression and alcohol abuse through therapy and medication. While it can be difficult to admit that there is a problem, alcohol use disorder treatment makes it possible to live a better life. Recovery from alcoholism is achievable even for those suffering from depression.